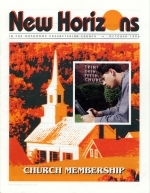 Church Membership: Option or Command? What is the church? What is the purpose of the church? What does it mean for me to belong to the church? These are perennial questions, and each generation of Christians needs to be ready with informed answers. That readiness is so essential not only because such answers are basic to our identity as believers in Jesus Christ, but also because in every generation wrong answers crop upanswers that in varying ways mislead the church and blur its identity. Can you sing this hymn ["I Love Thy Kingdom, Lord," by Timothy Dwight, from Trinity Hymnal] from your heart? It speaks warmly of Christ's love for his churchand of your love for it. I was raised in a loving Christian home and brought up in an Orthodox Presbyterian church. At age fifteen, I began to rebel against my parents, and for many years I continued down that path. I became involved in drugs and immorality, and even ended up in jail.